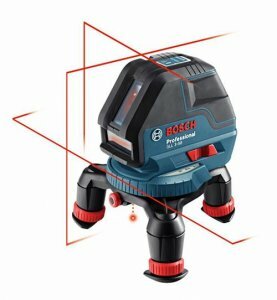 Bosch has announced that they have come out with the new GLL 3-50 three line laser, plus plumb dot. This laser looks to be a smaller cheaper alternative to the GLL 3-80, which uses a more complex optics system to produce three 360-degree planes. Unlike typical 2-line lasers, the GLL 3-50 features an extra vertical line that sits adjacent and allows the tool to project squaring lines. In addition, Bosch has included a plumb down point that can also assist in plumbing and squaring tasks. As with previous Bosch line lasers, the GLL 3-50 uses a pendulum system to self-level and provides indications when it is too far out of level to be correctly adjusted. The pendulum is kept safe during transport thanks to a locking mechanism that is enabled when the laser is in the off position. The laser features an accuracy of 1/8-inch at 33-feet, which can be extended to ¼-inch at 165-feet if you use the optional LR2 receiver. The GLL 3-50 also includes a three-legged mounting base that offers 360-degree rotation with adjustable legs to allow for height adjustments. This base seems to be more suited for floor level work, if you plan on taking the GLL 3-50 to the skies, you would probably be better off with the Bosch WM1 wall mount accessory. I haven't seen a price on the GLL 3-50 yet, but it is probably safe to assume it will fall between the price of the GLL 2-50 ($200) and the GLL 3-80 ($449).